Though I dedicate most of my time to reading and writing about young adult literature, I want to occasionally spotlight authors that write for younger children and adults that have shaped me as a reader. These won’t be simply reviews, but an introduction to the author’s work. Known for his never-ending sentences and lack of paragraph breaks and quotation marks, José Saramago can be an intimidating author, but the philosophical richness and dry wit of his prose are worth the laborious process of reading it. His works range from historical to speculative, yet most contain elements of magical realism. With an affinity for the ironic, Saramago writes allegorical stories that explore questions of life and death and human nature. Though the catalog at my library lists it under “romantic suspense fiction,” this doesn’t quite capture the magic of Baltasar and Blimunda. Set in early 18th century Portugal against the backdrop of The Inquisition, Baltasar, a solider who has lost his hand in battle and now wears a hook, falls in love with Blimunda, a woman with the the ability to see inside and beneath things, on the day he firsts glimpses her in the crowd of the auto da fé where her mother is burned at the stake. Together, they partner with a heretical priest obsessed with flight. The lively characters and historical details anchor the fantastical plot and compel the reader through sentences that span pages. 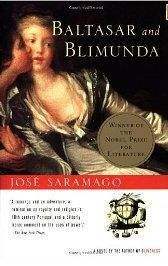 While characters are the heart of Baltasar and Blimunda, other novels by Saramago explore high concepts. Though a brief summary of Death with Interruptions — death takes a vacation and falls in love — may remind you of Meet Joe Black, Saramago’s novel is much more. Immortality may be a cultural obsession, but those who wish to live forever would do well evaluate the consequences of a society in which no one dies. Of course there are the obvious complications of a sharp drop in business for funeral directors and life insurance salesman, not to mention the problem it poses for the Catholic Church, whose teachings rely on the threat of death. The political, social, and economic upheaval that follows the celebration of death’s vacation provides much fodder for searing commentary on bureaucracy and a contemplation of the foundation of faith. When death resumes her work, she unexpectedly falls in love with one of her marks, a middle-aged cellist, and ponders her legacy and mission. Though its narrator would have readers believe “the many things that have been said about god and about death are nothing but stories, and this is just another one,” there’s not a Grim Reaper tale quite like Death with Interruptions. A newly translated novel by Saramago, Raised from the Ground is not about zombies, but a very personal look at three generations of landless peasants in the author’s native Portugal. Readers looking for an introduction to Saramago should try The Lives of Things, a collection of his early short stories. 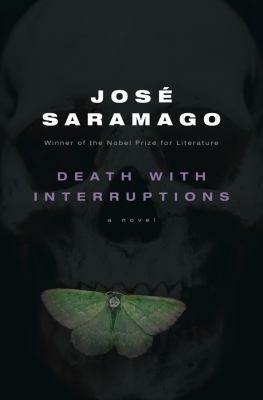 Other works by Saramago include An Elephant’s Journey, based on the real-life story of an elephant and his trainer’s journey across 16th century Europe, The Gospel According to Jesus Christ, a profoundly religious novel for a self-identified atheist who thought the world would be more peaceful without religion, and All the Names, the story of a clerk in the Central Registry who becomes intrigued by one woman’s records. Fans of Saramago will also enjoy his biography, Small Memories. 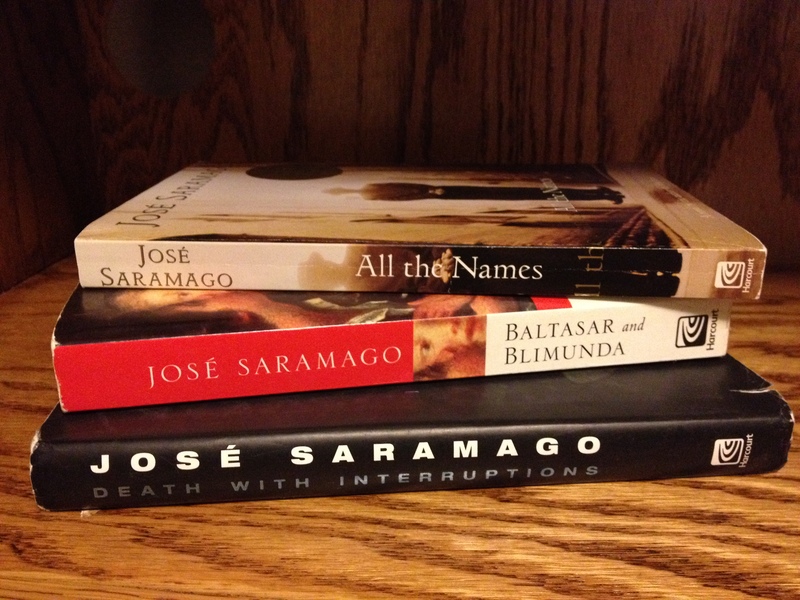 José Saramago is one of my favorite authors, and I hope you give him a try. I discovered him quite randomly by browsing the “recommended for you” suggestions on Amazon. My imagination was immediately captured, so much so that I wanted to rededicated myself to learning Portuguese (I took a year in grad school for my secondary language) just so I could read him without translation. The sentences are journeys themselves, and I got lost in their cadence. Even more than the beauty of the rhythm of the words, I loved their message. Saramago’s stories are anchored by lessons without coming off as moralistic. I still haven’t read all of his work, but look forward to acquainting myself with all of his stories over my lifetime. When I die, I’ll leave behind a whole shelf on my bookcase dedicated to this master of world literature. I still haven’t read Cormac McCarthy! B&B is my favorite — definitely for fans of historical and magical realism. I still need to read The Cave — Saramago has a lifetime’s worth of good books! Excellent post! You had me hooked at magical realism–that’s one of my favorite kinds of fiction. I haven’t read any really amazing magical realism in a while, so I’m looking forward to trying some of Saramago’s work. I remember hearing about the movie Blindness, I wanted to see it, but never did. I’d definitely want to read the book first. Is there one specific book of Saramago’s that you would suggest starting out with? I’ve only read B&B, Blindness, and Death w/ Interruptions. (Looking forward to the others still) if you like historical, I’d say go with B&B, and if you favor a more contemporary setting and a sort of dark humor, go for Death with Interruptions. Of course, Blindness is the one that won the Nobel, but I prefer the other two personally. This is a great author to add to my TBR pile. As much as I love YA lit, as much time as I spend with it, I always feel like I’m a richer reader for those books that I read outside. Though I haven’t read his books since college, I think of Arturo Pérez-Reverte’s books in a similar way. Oh, I checked him out and added to my to-read! Thanks for the suggestion, it’s right up my alley. I love YA too, but I still try to balance it with adult literature.